Access to the members' section is restricted to current subscribers of Wordens Past. By clicking on the links in the Archives section of this website to access past issues of Wordens Past, you will be prompted to log in to the members' portion of this website. 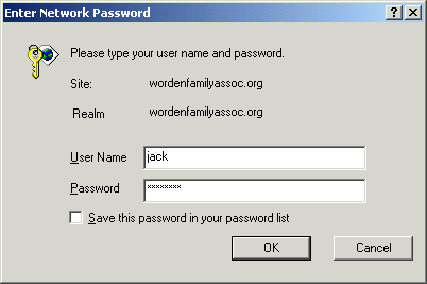 You should have received your userid and password in the August 2009 issue of Wordens Past. If you did not, or are a new subscriber, please contact either Pat Worden at pwarden12@charter.net or Bill Worden at william@wordenfamilyassoc.org for your userid and password. Subscriptions to Wordens Past are available for $15 annually. For further information on subscribing to Wordens Past, please contact our Treasurer, Carolyn Stubbs MSSchne@aol.com.